Gord at a book signing at the 2014 AMO conference. There are two great tectonic shifts happening in government right now – first, a very different and difficult political climate; and second, a vast technology revolution that is changing jobs, business, lives and municipalities. Getting Cities Right offers a bold and intrepid look at the current political environment globally, and how that impacts local governments. And, it shares a thoughtful and challenging analysis of the new technology that is changing how we live and work – and how municipalities will do business. Getting Cities Right is about the future of local government in the face of these challenges. It is about creating modern urban centres that will flourish by embracing innovation, technology, and a more global perspective. It is about getting cities right. It is being called the most powerful book that Gord has written. From Artificial Intelligence, to the Internet of Things, to Sentient Tools, to Robots and Bots, this exciting new book offers readers a heady picture of the changes that are coming. These opportunities are contrasted against the stark reality of how city halls and municipalities have been operated and managed in the past, and against global political uncertainties that loom large. This is the time to question the traditional rules of how our towns and cities have been financed, governed, and operated. Highlighting weakness in everything from the property tax system to local government’s legislative powers, the book argues that cities can be the new leaders in innovation and creative ideas – but need to have more authority if they are to thrive. In-depth interviews with four leading mayors from around the world are a highlight of this must-read book. These political veterans share their unique insights and strong beliefs about improving local government. While their comments are blunt and sometimes controversial, they will provide readers with dramatic insight. Getting Cities Right. A powerful new book that is a must-read for everyone interested in municipalities, community, government and building better cities. The political high-road during the 2016 US Presidential primaries and subsequent campaign was a dark, cold and lonely stretch of highway. The opportunities for innovation and creativity in local government have never been greater—or more urgently required. “Joint government action” to target a specific issue doesn’t work very well when the firing squad is arranged in a circle. Cities need the courage to be audacious in a too-often beige government world. Infrastructure is really the platform for how municipalities improve the lives of their citizens. Infrastructure is the glue that holds together the economic, cultural and social structures that fortify and animate a more civilized community. The politics of politics has become nastier and nastier. If it took God seven days to create the world, it took Donald Trump just eight days in office to create global chaos. This is the question hanging over every election in the western world right now: have common sense and good taste been trumped by bombast, bullying, and bizarre behaviour? Are we now living in a media and political world of ‘alternative facts’ and ‘post-truth’? In the bluntest of terms, this is the question that is keeping me awake at night: does truth matter anymore in a political campaign? Or while governing? 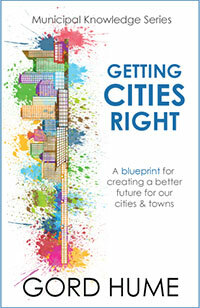 ORDER YOUR COPY OF “GETTING CITIES RIGHT” today by visiting: www.municipalworld.com or call or 1-888-368-6125.